Makes it easy for you to buy and refill prescriptions through our vet store, Vets First Choice. NexGard - Oral Flea and Tick preventative and treatment given monthly as a chewable treat sold and recommended at Gulf Gate Animal Hospital by our sarasota vets. Heartgard - Monthly oral heartworm preventative and roundworm, and hookworm treatment beef chew recommended at Gulf Gate Animal Hospital by our sarasota vets. Heartworm Disease Information - Everything you ever wanted to know about heart worm disease treatment and prevention in your dog can be found here! Trifexis - Monthly oral flea and heartworm preventative and roundworm, hookworm and whipworm treatment in a flavored tablet recommended at Gulf Gate Animal Hospital by our sarasota vets. A Pets Traveling Needs - This website contains various information about traveling with your pet. Intestinal Parasites - This is a website with various information regarding veterinary dog and cat parasites. National Pesticide Information Center - Report Adverse Reactions to Pesticide Products, this website will answer any non-emergency questions about pesticides. Royal Canin Veterinary Diets - Gulf Gate Animal Hospital’s Sarasota vets recommend several types of Royal Canin dog and cat diets to help with a more natural treatment of many specific disease processes. Royal Canin Pet Foods - For generally healthy animals Gulf Gate Animal Hospital’s Sarasota vets recommend Royal Canin Brand Pet foods that are tailored to many different breeds and sizes of dogs and cats. Hills Prescription Pet Foods - Gulf Gate Animal Hospital offers the whole line of Hills Prescription dog and cat food diets to help with a more natural treatment of many specific disease processes. Science Diet Pet Foods - For generally healthy animals Gulf Gate Animal Hospital’s Sarasota vets recommend Science Diet Brand dog and cat foods. Breeds of Dogs - An American Kennel Club quick reference guide to many breeds of dogs, including photos and brief descriptions of each breed's characteristics. Training your Puppy - Founded by Brian Kilcommons, a best-selling author and recognized expert on animal training and behavior, this site is a terrific resource for advice on training and socializing your puppy from day one to prevent behavior problems so you and your puppy can enjoy a happy and fun filled life together. Association of Pet Loss and Bereavement- We have all experienced the pain of losing a pet. The Association of Pet Loss and Bereavement has set up this site for support during this most difficult time. You will find inspirational stories, grief counseling resources, hotline number and many other resources. Pet Poison Helpline - This is the website of a nationally run helpline for veterinarians and clients with cats or dogs that have had exposure through ingestion or contact to potentially toxic or poisonous substances. Our Sarasota vet clinic uses them to get the best information for some unusual toxicities of pets. They have veterinary toxicologists, veterinary internal medicine specialists and veterinary emergency specialists on hand to give the best advise available to treat your pet. The veterinary website includes a library of potential pet toxins and poisons as well as poisonous plants including the most common symptoms of each. The pet poison site also contains links to other sites, and phone numbers for the poison control center. As always if your pet may be dealing with a toxin call Gulf Gate Animal Hospital for a phone consult to see if your pet needs to be seen and emergency steps that sometimes can be taken at home immediately. Toxic Plants - ASPCA - Alot of information about plants that can be toxic to your dog or cat. You can search under common name or scientific name of the plants that can be found in Sarasota. By identifying the plant correctly our Sarasota vets can give the best care to your pets at our veterinary hospital. Veterinary Schools in the US - This is a great link to all of the websites of veterinary schools and veterinary school hospitals in the United States. International Pet Travel - This USDA site explains how to travel with your pet internationally and provides links to more detailed requirements for each individual country and for return to the United States. Most countries require a International Health Certificate and Exam by a USDA accredited veterinarian within 10 days of travel. All our Gulf Gate Animal Hospital’s Sarasota Veterinarians are USDA accredited. Rainbow Bridge - At Gulf Gate Animal Hospital we realizes that loosing a pet can be emotionally devastating. Our vet team has found this site for great ideas about ways to memorialize our lost dog, cat or other family pet. West Nile Virus - This site is maintained by the Centers for Disease Control in Atlanta, and has the latest information on the spread of West Nile Virus in the US. It also has information on other veterinary transmitted diseases and symptoms. American Veterinary Medical Association - This site has an up to date news bulletin board about a variety of topics in veterinary medicine. All our animal hospital's vets are AVMA members. Cat Ownership - This website offers great information on caring for and adopting a cat. Our Sarasota veterinarians take special care so your furry feline has the best possible experience at our veterinary hospital. Veterinary Partner Network - This is a website portal of the Veterinary Information Network of which Gulf Gate Animal Hospital’s sarasota veterinarians belongs to and has detailed information on dog, cat, small mammal, reptile, and horse behavior, nutrition, first aid, medication, dental care and medical conditions. 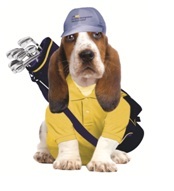 Sarasota Obedience Training Club - Our Sarasota vets strongly recommend obedience training for all puppies. It is never too early or too late to start, but ideally all puppies should start classes between 3-4 months of age. This training helps bond owner and pet from the exclusive time you spend with them. Training can also help vent off that puppy energy, decreases unwanted behavior problems, and can help keep your puppy safe if he/she would ever get away from you. Their number is 941-377-5984. Invisible Fence Brand - Established in 1989, Invisible Fence of the Gulf Coast is an authorized, full service Invisible Fence® Brand dealership serving Manatee, Sarasota and Charlotte Counties. Our professionally trained staff is fully focused on protecting your pet with Invisible Fence® Brand solutions. From installing your system, to training your pet with our exclusive Safe Dog™ and Perfect Start™ training to making sure you get the customer support when you need it, Invisible Fence of the Gulf Coast is there to help. Whatever the breed, size or temperament of your pet, we can help protect him from danger while being free to play. With over 4000 satisfied local customers as well as support from neighborhood veterinarians, we'll work hard so you can rest easy knowing your pet is safe at home.